The Health Finance and Governance (HFG) project has promoted the use of digital financial services (DFS) in health for the past five years. 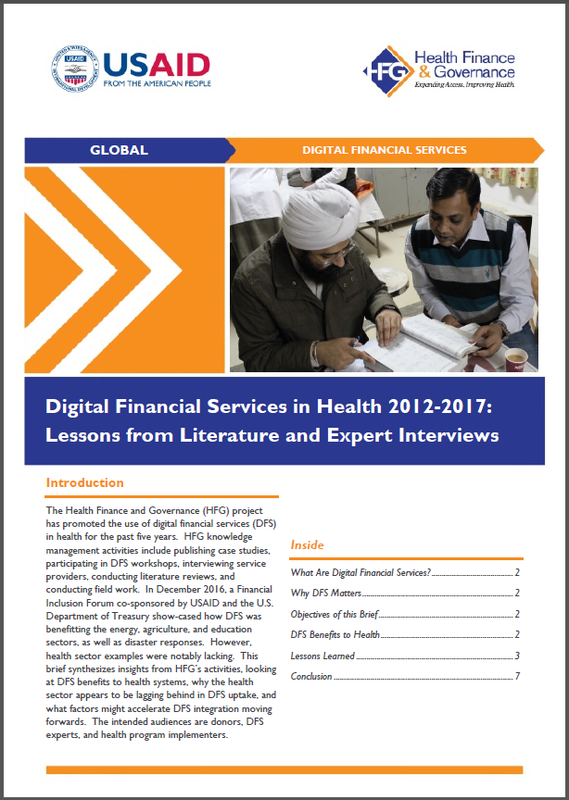 HFG knowledge management activities include publishing case studies, participating in DFS workshops, interviewing service providers, conducting literature reviews, and conducting field work. In December 2016, a Financial Inclusion Forum co-sponsored by USAID and the U.S. Department of Treasury show-cased how DFS was benefitting the energy, agriculture, and education sectors, as well as disaster responses. However, health sector examples were notably lacking. This brief synthesizes insights from HFG’s activities, looking at DFS benefits to health systems, why the health sector appears to be lagging behind in DFS uptake, and what factors might accelerate DFS integration moving forwards. The intended audiences are donors, DFS experts, and health program implementers.